Ogham (OH-am) is an ancient alphabet used to write Old Irish and other Brythonic/Brittonic languages (such as Pictish, Welsh) from about the 3rd century CE. The Ogham alphabet is sometimes called the ‘Celtic Tree Alphabet’ as each letter is assigned a tree or plant name. However, this was probably done after the initial creation of the Ogham script. After about the 6th century CE, the Roman alphabet was used to write Old Irish, therefore the Ogham alphabet declined in popularity. 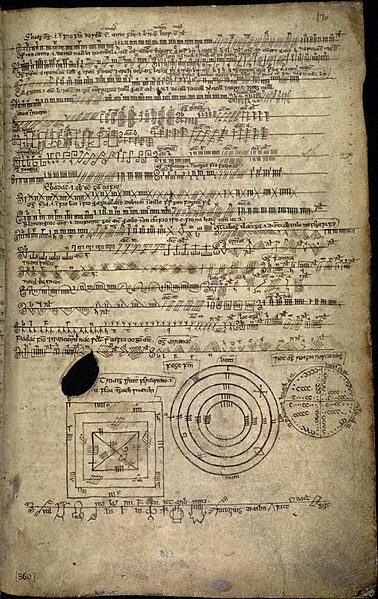 However, the 14th century Book of Ballymote (Leabhar Bhaile an Mhóta) contains genealogies, mythologies, and histories of Ireland written in Ogham script. The Book of Ballymote also contains older manuscripts which contain Ogham script, such as the 11th century Lebor Gabála Érenn (The Book of the Taking of Ireland) and the 7th century Auraicept na n-Éces (The Scholars’ Primer). Another important document that contains detailed descriptions of Ogham is the 14th century In Lebor Ogaim (The Book of Ogams, The Ogam Tract), which is mentioned in Auraicept na n-Éces. Several of these manuscripts describe how the Ogham alphabet was invented soon after the Tower of Babel (along with the Gaelic language) by the Scythian king Fenius. However The Ogam Tract states that the alphabet was created by the Irish god of communication and writing, Ogma/Oghma (Ogmios in Gaul). Ogham inscriptions have been found throughout Ireland and western Britain. Most ancient inscriptions are found along the edges of large stone slabs and consist of personal names, such as ‘X son of Y’, probably as territorial markers or memorials. It is thought that Ogham letters would have also been inscribed on sticks, stakes and trees. Bilingual inscriptions have been found which aid in translation, such as Ogham and Latin, or Ogham and Old Norse (written in the Runic alphabet). A fifth group, forfeda, was added after the 6th century, probably due to changes in the Irish language. The alphabet is generally written vertically from bottom to top, mostly found inscribed on stone slabs. However horizontal script is also found, written from left to right, mostly in manuscripts. The letters are linked together by a solid line. In his book The White Goddess, Robert Graves discusses the Ogham alphabet in reference to Celtic religious beliefs and ceremonies. He proposes that the order of Ogham letters form a calendar of tree magic, with each letter corresponding to a Celtic month. December 23 is not ruled by any tree, it is the traditional day in the “Year and a Day” in early courts of law. Robert Graves followed the older interpretation of ‘Beith-Luis-Nion’ as the first three Ogham letters. However most modern scholars place the order of Ogham letters as ‘Beith-Luis-Fearn’. Oghams are also used by Neopagans as divination tools, as mentioned in the Tochmarc Étaíne, from the Irish Mythological Cycle. Ogham symbols are written on sticks or other pieces of wood and thrown on the ground, studying the symbolism of where they fell.